A new product released by The Perth Mint of Australia and apparently very popular with collectors is the Doctor Who 50th Anniversary 2013 1oz Silver Proof Coin. 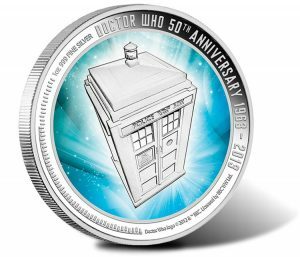 Prominently featuring Doctor Who’s time-travelling space ship dubbed the TARDIS, or "Time and Relative Dimension in Space," The Perth Mint is noting "overwhelming demand" for the silver coins and is warning potential buyers that there will be a delay in fulfilling orders. The mintage of the coin is restricted to 10,000. Doctor Who is a British science fiction television program by the BBC. It debuted on November 23, 1963 and has set a Guinness World Record as the longest running science fiction TV series. Doctor Who uses the TARDIS to travel through space and time to battle foes. The TARDIS has an interior that is exceptionally large, yet an outer appearance of a blue British police box that was commonly seen in the 1960’s. It is the TARDIS that is found as the focal point of the coin’s reverse. It is cast against a color background that symbolizes multi-dimensional travel. Around this scene is a frosted border with inscription reading DOCTOR WHO 50TH ANNIVERSARY 1963 – 2013. In smaller print is the coin’s weight and purity of 1 OZ 999 FINE SILVER and the BBC license information, "Doctor Who logo © 2012 & ™ BBC. Licensed by BBCWW Ltd."
Under official license of BBC Australia & New Zealand, 2013 Doctor Who 50th Anniversary Coins are struck by The Perth Mint on behalf of New Zealand Mint. They are issued by New Zealand Mint as legal tender of the South Pacific island nation of Niue. As such, obverses of the coins show the Ian Rank-Broadley effigy of Her Majesty Queen Elizabeth II. Around here are inscriptions reading ELIZABETH II, NIUE, TWO DOLLARS for the coin’s denomination and the 2013 year-date. In a unique touch, each anniversary coin comes within a presentation case that is shaped like the TARDIS. Its doors open to the familiar ‘vworp vworp’ sound to show the coin and a numbered Certificate of Authenticity. 2013 Doctor Who 50th Anniversary Coins are available worldwide directly from the Perth Mint of Australia (www.perthmint.com.au). The anniversary coin is priced at AUS $104.54, or US 95.79. Pricing is subject to change based on the market conditions of silver. Ok,the Nerd inside of me is aching to get this coin! When I was in high school back in the early 80’s I loved watching Dr Who syndicated shows on PBS. I just wish I could justify buying it now to my wife. Is there more silver on the inside than on the outside? Would love to get this but, I’m sure half the cost is the display case (which is very nice). The Royal Mint had some medallions of Doctor Who a few years ago but they seem to have exhausted their stock and they would not ship them outside of the UK.